Madison College baseball player Matt Cole looks up after connecting with a pitch during a recent home game. 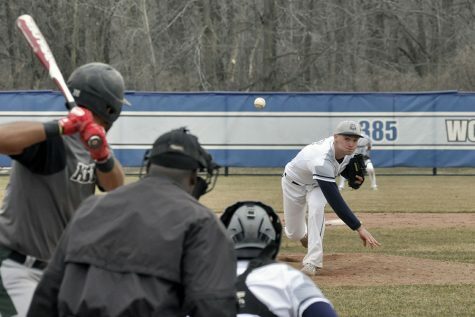 Conference play is in full swing, and the Madison College baseball team is off to a promising start. The team has a 15-1 record in North Central Community College Conference play, with its only loss coming in a doubleheader split on the road at Joliet Junior College. 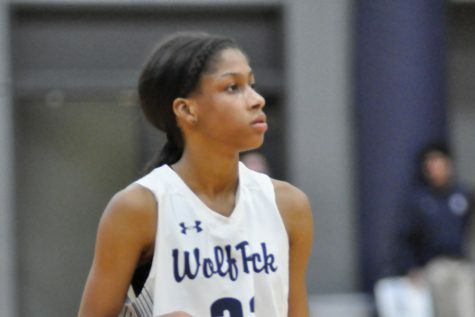 Madison College has eight conference games remaining, including another doubleheader with Joliet Junior College that could determine the conference title. 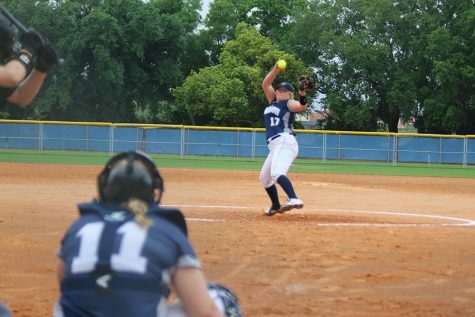 Most recently, Madison College picked up a pair of conference wins over Triton College on April 19. Both teams had just five hits in the first game of the home doubleheader, but Madison College pushed in a run in the bottom of the fifth inning for a 2-1 victory. Luke Yapp had two hits to lead the WolfPack, including an RBI single that scored Brandon Gibis in the the first inning. Mike Jordahl drove in the winning run with a fielder’s choice that scored Travis Hamilton, who had walked. Derek Heffel pitched the win, giving up one run on five hits and just one walk. Heffel improved his record to 5-0. The second game of the doubleheader saw more scoring, but the result was another one-run victory for Madison College, 4-3. Yapp had a walk-off RBI single with the bases loaded in the bottom of the seventh inning. Yapp led his team with two hits and two RBIs. Sam Hurt added three hits and scored one run, while Travis Hamilton had two hits and a walk. Jared Horton earned the victory in relief after pitching a scoreless seventh inning. Brandon Parr started the game for Madison College and gave up three runs on eight hits in six innings. Madison College’s overall record now stands at 23-10, having won its last four games. Despite having 14 hits, Madison College had to sweat out a 5-3 victory over Harper College in the first game of a doubleheader on April 18. Brandon Gibis had four hits, including a double, and scored two runs to lead Madison College. Tony Butler added three hits, including a double, and scored two runs and hit in two more. Marcellus Sneed pitched the win for Madison College to improve his record to 3-0. He gave up three runs on 10 hits and had five strikeouts. Jared Horton earned the save, pitching a scoreless seventh inning. There was a lot more scoring in the second game of the doubleheader, with the game in doubt until Madison College scored eight runs in the fifth inning to help secure a 16-10 win. Tony Butler and Sam Hurt both had four hits in the game to lead Madison College. Butler scored two runs and hit in two other runs. Hurt scored three runs and had one RBI. Nick Kanavas also had a big game with three hits, two runs scored and four RBIs. Kanavas, Butler and Mike Jordahl each doubled in the game, while Travis Hamilton hit a triple. Clayton Uselman earned the win in relief, giving up just two hits and one run in three innings. Although they were limited to just three hits, Madison College found a way to rally for a 2-1 victory over Black Hawk College on April 16. After Black Hawk scored an unearned run on a wild pitch in the top of the second inning, Madison College tied the game with an RBI sacrifice fly by Mike Aiello that scored Travis Hamilton. Then, in the bottom of the seventh, Brandon Gibis hit a sacrifice fly that scored pinch runner Ryan Makuski and ended the game. Brandon Parr earned the win in relief, giving up two hits and no runs in two innings pitched. Westin Wuethrich pitched the first five innings for Madison College, allow one unearned run on two hits and seven walks. A four-run second inning provided Black Hawk College with all the runs it needed against Madison College in a 4-1 victory in the second game of the doubleheader. Madison College’s only run came in the first inning, when Courtney Watkins was hit by a pitch with the bases loaded. Luke Yapp led Madison College with two of the team’s three hits in the game. Ryne Blanton pitched the loss, giving up four runs on nine hits in six innings. 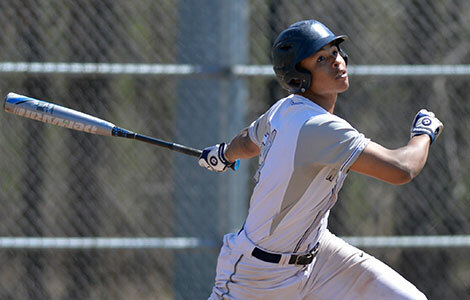 Madison College scored twice in the first inning and twice in the second inning before holding on for a 4-2 victory over Elgin College in a nine-inning game on April 13. Tony Butler led Madison College with four hits. Matt Cole and Luke Yapp both added two hits. Yapp and Sam Hurt both doubled in the game. Derek Heffel pitched the win for Madison College, giving up nine hits and two runs in six innings. Brandon Gibis earned a save in relief, allowing no runs in the final three innings. A three-run third inning powered Madison College to a 3-2 victory over Joliet Junior College in the first game of a doubleheader on April 12. Sam Hurt walked with the bases loaded to score the first run. Then Mike Jordahl singled to drive in Tony Butler and Brandon Gibis. Marcellus Sneed pitched the win allowing just two runs on three hits in six innings. Ryne Blanton earned the save, pitching a scoreless seventh inning. A six-run first inning led Joliet Junior College to a 13-3 victory over Madison College in the second game. Joliet had 12 hits in the game and scored in every inning but the fourth inning. Madison College scored all its runs in the first inning, and was shut out the rest of the way. Jarod Richter pitched the loss, giving up seven runs on five hits and two hit batters in two innings.